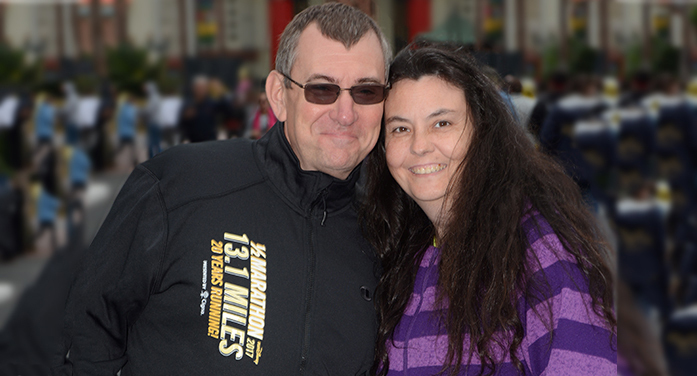 What could have attracted this couple, Angela and James Wise, to such a challenging, dopey run? Angela and James Wise met in their high school math classroom, at STHS. It was Algebra3/Trig that they were studying while studying each other. Of course they eventually married, but math seemed to be at the root of their connection. Angela went on to Lander and continued the study of math and James went on to work at Milliken where he began his career in software engineering. He is now at BMS Vision (Belgium based) where he monitors systems and collects statistics for large companies. It was obvious that these two know numbers well, for the press release about their run in Florida is full of statistics. Angela now teaches statistics in the same room at STHS in which the two met so many years ago. James has been a runner for a long time; Angela says she is new to this, by a couple of years. “I could not have done this race without James’s encouragement. He worked with me and pushed me to do beyond what I thought I could do,” says Angela in an interview this week. James actually had a broken foot which happened in a prior race in which he came in 7th, in spite of the break. Angela had a case of planters fasciaitis and managed to get that well enough to run. A devotion to numbers (math and statistics) brought them together. Now, a race that required so many numbered episodes (4 days, 4 parks, 48.6 miles) helps one to understand one attraction to running such a marathon — that is, in spite of “never running a marathon” before, and in spite of injuries that could have discouraged them.